1 - Stop lecturing them and let them play! Today’s coaches understand that today’s kids learn by doing. The days of 15 kids watching while you talk about the slides or the offense for 30 minutes are long gone. I want to scream when I see coaches blathering on and on and on without noticing the glazed over look in the kids eyes. Just stop and ask the kids to repeat what you said. I am going to guess that about 1/4 can do it. If you need to lecture use the whiteboard or do it in a classroom, or before practice. But once they have their pads and and are moving, keep it moving until practice is over. This will also greatly increase the amount of touches they get with the ball. As we all know.. more touches = greater stick skills. 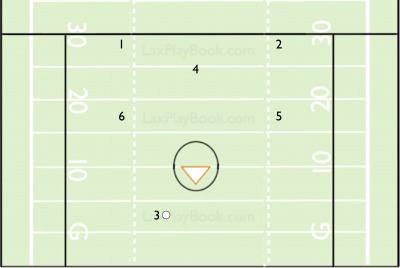 Take lacrosse drills and making them snapshots of game situations. This is not a slam on traditional 3 Man Ground ball Drills, nor a ‘dis’ on traditional Line Drills. But I wonder how many times in a game we roll a ball directly away from our teammates. But you have to ask yourself "with the limited time I have, is this the most applicable to the game we are about to play"
I much prefer those 3 man guard ball drills or line drills for camps and clinics. This site is dedicated to find many drills that can be done to emulate your specific game scenarios. Many of the coaches use shooting drills also as a warm up drill. And many coaches, since it is a warm up drill, incorporate their poles and even Goalies in these drills. The focus is on shooting, but the focus is also on multiple touches. This is not as hard as you think. Remember that if the kids are out there chances are they enjoy playing lacrosse so…. let them play. This takes a little planning, but the key elements are changing drills day-to-day, shorter drills, and drills incorporating some level of competition. In addition most of the top coaches we have interviewed spend a higher percentage of their ‘scrimmage-type’ time in practice in unsettled scenarios, i.e., 3V4, 4V5, etc, and usually in progression. The kids then play faster and ball movement is at a premium. And it is more fun. You might think you run a fast paced practice, but would your players agree? Can you honestly say that in a two-hour practice you are running at least ten to twelve different drills? Do you analyze the structure of your practices? The is radical change from my old style where if a drill was not working or the kids were struggling we kept doing the drill until we got it running effectively. Going from drill to drill will break up the practice and make it go by much faster.